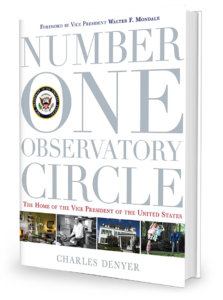 America’s Vice Presidents have called Number One Observatory Circle their official home since 1974 when Congress authorized the removal of the Chief of Naval Operations (CNO) from the grand Queen Anne style home on the grounds of the US Naval Observatory. Nelson Rockefeller was technically the first vice president afforded the opportunity to live in the home, yet he chose to reside instead at his luxurious mansion at 2500 Foxhall Road. It wasn’t until 1977 that Number One Observatory Circle had its first full-time vice presidential resident – Walter Mondale and wife Joan and their three children. Since then, the 1893 three-story brick home covered in white paint has been the official residence of every sitting vice president. Noted federal cybersecurity & national security expert and vice-presidential historian Charles Denyer walks you through the halls of Number One Observatory Circle, offering never before seen photos of the home where America’s vice presidents live. From the Mondales playing touch football to the Bidens hosting events for our nation’s wounded warrriors, Charles Denyer brings to life this amazing home with the first-ever groundbreaking publication titled, “Number One Observatory Circle, the Home of the Vice President of the United States.” Available in limited edition hardback, the book is filled with hundreds of photos and countless stories chronicling the lives of all those who lived and worked at Number One Observatory Circle since it became the official residence of America’s vice president. © Copyright Charles Denyer. All Rights Reserved.